Who tells history? Who knows about it or who has the opportunity to do it? We can find multiple versions about the history of contemporary music created with electronic technologies, most of those with subtle differences, but it has been unusual -until recently- to find references pointing to countries out of a small group from Europe and North America. Can we change the way history is being told? Do we have something different to tell? Why should we invest time and effort on it? Several projects have been developed to change the current biased situation. The Latin American Electroacoustic Music Collection, hosted by The Daniel Langlois Foundation for Art, Science and Technology, represents an example of the relevant role and the impact that the archival of electronic artworks and its public access can play in having another perspective about history. The journey from the cultural memory and the ethical concerns to the practical strategies on preservation and the impact of disseminating knowledge generated by electronic art has been navigating a sinuous road. Electronic artbs memory has been partially dead, or maybe deaf or blind, or simply looking to the other side, perhaps to avoid the perception that the so-called electronic (and later, digital) revolution has reached most of the known world and that history does not only happen in a few bcentralb countries. The desire of some for being a cultural lighthouse as much as the guardian of the bright valuesb and the bsignificant artb should not take us all to mislead that intelligence and sensibility belongs to a few. Who tells history? Who knows about it or who has the opportunity to do it? We can find multiple versions about the electronic and computer art history, most of those with subtle differences, but it has been unusual -until recently- to find references pointing to countries out of a small group from Europe and North America. Inequalities have always existed and if we want to see a change, probably we will need to work hard ourselves to produce new results. There are many lost and hidden stories on electronic art that probably should be part of the official history and not just left aside. When the people is developing new ideas and concepts, creating artworks, researching and discovering or inventing, we expect someone will take care of keeping the memory of all that for us but sometimes it simply doesnbt happen and when we look around after a while, it seems that the history has not been the one we thought it was and we remember, but a different one that is being told by others. Between the obsession for archiving everything and the difficulty and strong responsibility of deciding what to preserve, the opportunity to archive electronic and computer art makes us face a challenge involving from technical issues to political, social, cultural and economical aspects. How many histories can be told about the same subject? To who their narrative is directed? Today, the digital divide could be not linked to who has access to the web but to who dominates the inclusion of content or develop the strategies to keep our attention on certain places and not others. It looks like we are bombarded with cues guiding us to consider that the art conceived by some cultures are the only ones to be recognized as valid. The Daniel Langlois Foundation for Art, Science and Technology  in Montreal has been a leading organization focused on studying theoretical aspects related to preserving electronic and computer art, and actually archiving it. A number of major projects have been developed or hosted by this Foundation since the late 90s, including the Steina and Woody Vasulka Fonds, the 9 Evenings: Theatre and Engineering Fonds, the Collection of Documents Published by E.A.T. and the Latin American Electroacoustic Music Collection , among others. The political and economic instability in most Latin American countries have been deeply affecting the life of its inhabitants for decades. Support for artistic activities has usually been postponed to solve urgent social problems. In spite of that, the development in the region of the electronic arts in general and the electroacoustic music in particular, is really astounding. To name but a few examples: Mauricio Kagel (Argentina, 1931 - Germany, 2008) composed eight electroacoustic studies in Argentina between 1950 and 1953, according to Hugh Daviesb International Electronic Music Catalog published in 1968 . Kagel was one the pioneer composers that were laying the foundations of a rich history of experimentation and creation in the region. León Schidlowsky and Juan Amenabar in Chile, Joaquín Orellana in Guatemala and Horacio Vaggione in Argentina are only some of the many names in the ocean of electroacoustic music creativity that has always been Latin America. In Brazil, Reginaldo Carvalho composed Si bemol for tape, in 1956 . José Vicente Asuar composed between 1958 and 1959 in Chile his piece Variaciones Espectrales using only electronic sound sources. The Estudio de Fonología Musical was created in the University of Buenos Aires, in Argentina by Francisco KrC6pfl and Fausto Maranca at the end of 1958. During those same years, and also in Argentina, César Franchisena was experimenting with electronic sound sources at the National University of Córdoba radio station, where he composed Numancia, ballet music on tape, in 1960. In Cuba, Juan Blanco composed Música para danza for tape in 1961, Interludio con máquinas, also for tape, in 1963  and Texturas for orchestra and tape between 1963 and 1964. Blanco composed around a hundred works using electroacoustic media, including music for mass public events and large venues, like the five-tracks 1968 tape piece Ambientación Sonora, played during 30 nights along La Rampa Avenue in Havana. Carlos Jiménez Mabarak composed in Mexico El paraíso de los ahogados, a piece on tape, in 1960. Jorge Antunes B produced his first electroacoustic pieces working at his home studio in Brazil. After Pequena peça para mi bequadro e harmônicos in 1961, he composed Valsa Sideral in 1962 . .
Jorge Antunes in the early days of electroacoustic music in Brazil. 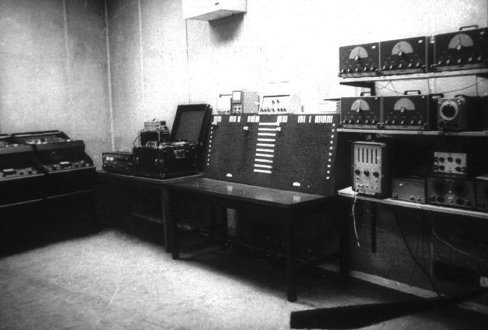 A landmark in the electronic music history of Latin America was the lab created in Buenos Aires during 1963 at the Centro Latinoamericano de Altos Estudios Musicales - CLAEM of the Instituto Torcuato Di Tella (the Electronic Music Laboratory was part of the Latin American Higher Studies Musical Center of the Torcuato Di Tella Institute). The Center was founded in 1962 and was directed by the Argentinean composer Alberto Ginastera. The CLAEM was a meeting point for students and composers from Latin America. They had the opportunity to learn and exchange ideas with some of the most interesting composers at that moment, many of them coming from Europe and North America, as for example: Luigi Nono, Iannis Xenakis, Bruno Maderna, Aaron Copland, Olivier Messiaen, Vladimir Ussachevsky and Luigi Dallapiccola. Peruvian composer César Bolaños created Intensidad y Altura, the first tape piece produced at that lab, in 1964 . . The CLAEM Electronic Music Laboratory, 1964. 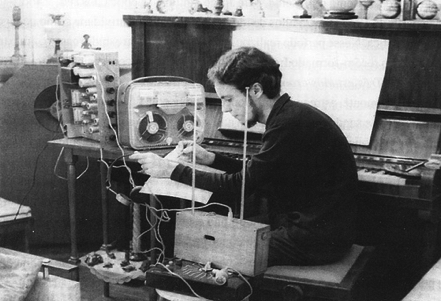 Engineer Raúl Pavón built in 1960 the prototype of a small electronic musical instrument featuring an oscillator with multiple waveform outputs, a white noise generator, filters, an envelope generator and a keyboard. Named Omnifón by Pavón, his creation was among the first voltage-controlled electronic sound synthesizers. Well before that, in the early 40s, the aforementioned composer Juan Blanco designed an innovative electronic instrument similar in concept to the Mellotron. His Multiorgan was based on 12 loops using magnetophonic wires. It predated the Mellotron -that is considered the predecessor of the digital sampler, an instrument that changed the way of doing music- by several years. Fernando von Reichenbach invented in Argentina the Analog Graphic Converter in the 60s. 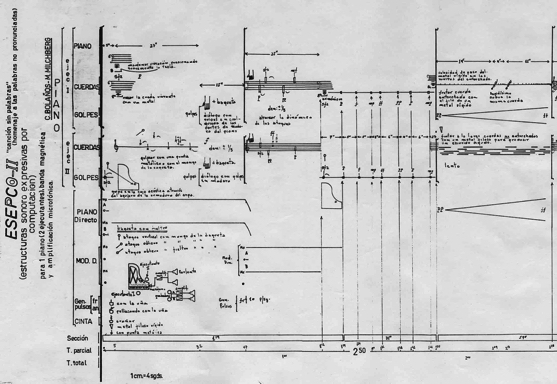 It was used to transform graphic scores -from pencil drawings done on a paper roll- into electronic control signals adapted to work with analog sound equipment. He also redesigned CLAEM's Electronic Music Lab and invented several other devices, such as the keyboard-controlled polyphonic third/octave and octave filter and a touch-controlled patch-bay that helped composers to simplify some cumbersome processes in the studio. Today, Reichenbachbs inventions are starting to be internationally recognized. . Partial view of the CLAEMbs lab, redesigned in 1966 by Reichenbach. Touch-controlled patch-bay developed by Fernando von Reichenbach at CLAEM. It was built with spare parts from a telephone company. The Analog Graphic Converter developed by Fernando von Reichenbach at CLAEM during the late 60s. It is worth mentioning the experiences of composer César Bolaños with the mathematician Mauricio Milchberg in Buenos Aires during the late 70s, when they were experimenting with computers to organize compositional materials. Those works led to the creation of two pieces: Sialoecibi (ESEPCO I) for piano and one reciter-mime-actor and Canción sin palabras (ESEPCO II) for piano with two performers and tape, both from 1970. .
Canción sin palabras (ESEPCO-II) for piano and tape by César Bolaños in collaboration with Mauricio Milchberg. José Vicente Asuar produced in Chile a hybrid analog-digital computer system in the mid 70s, exclusively devoted to create music. He designed and built a musical instrument based on the Intel 8080 microprocessor: the Computador Musical Digital Analógico Asuar or COMDASUAR, composing several pieces with it. Unavailability of musical recordings, bibliography and almost any basic reference to the electroacoustic music activities that were developed since the early 1950s in several Latin American countries was commonplace around the mid-1970s. That situation did not change much during several decades. In various Latin American countries, universities, state organizations and major private foundations have taken initiatives to support art research and the use of new media already in the early 60s, but most have stopped before developing the resources to document their processes and preserve the results. 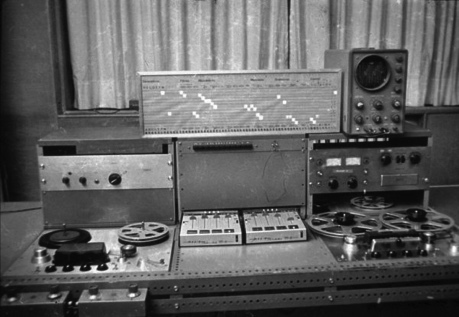 Many early tape compositions, for example, have been lost or the master recordings damaged. The Latin American Electroacoustic Music Collection, with over 1,700 digital recordings of compositions by almost 400 composers , and accompanied by photographs, scores, interviews, a trilingual historical essay  and over 200,000 words in its database, represents an example of the relevant role that the archival of artworks and its public access can play in having another perspective about history. This is today a key resource in the field, being consulted extensively by people from around the world each month (e.g. researchers, composers, performers, musicologists, historians, artists and the general public) that can also contribute to transform the usual perception of bownershipb that exists in some countries with respect to the electronic and computer art history. The archive includes compositions originally produced for fixed media (tape, DAT, CD, HD or similar) as well as recordings of mixed works for acoustic instruments or voices and fixed media or live electronics/interactive systems. There are also some multimedia pieces in the database. In the case of compositions for fixed media and other sound sources (e.g. mixed works), full recordings as well as btape onlyb parts (i.e. fixed media) are preserved and catalogued. The archive also has audio and audiovisual recordings of interviews  to composers and technical innovators (e.g. Manuel Enriquez from Mexico, Alberto Villalpando from Bolivia, Edgar Valcarcel from Peru, Alfredo del Mónaco from Venezuela) as well as photographs, videos and some scores (e.g. by alcides lanza from Argentina, Javier Alvarez from Mexico, Milton Estevez from Ecuador, Edson Zampronha and Jônatas Manzolli from Brazil). From a technical perspective, the archiving of audio material went through a myriad problems: recovering from massive hard disk crashes, finding analog tape recorders with old track formats, re-digitizing material to correct severe DC offsets in brand-new equipment, computer operating systems and FireWire conflicts, etc. Defining how best to work with very noisy old recordings was another challenge (a few pieces were processed using an advanced de-noise system to moderate hiss, always preserving the original recording and following the composerbs advice). The bulk of the process was done between 2003 and 2005 at the Langlois Foundation, working with three different computers and nine hard disks to manage the audio and visual files, the database and the large amount of info, together with the daily international communications. Worth mentioning that while the recording quality of some music stored on old analog tape could have suffered through the years, digital technologies for recording storage were the ones presenting the most difficult challenges. For example, some DATs (Digital Audio Tapes) lost part of their recordings and only a loud digital noise was in place of the music. In those cases the problem was not only a poor quality (e.g. because of hiss or the loss of high frequencies) but a complete lack of the recorded signal, without any possibility to recover the original material. There are 1,723 compositions preserved as digital audio -with CD quality- in the database. While all is available for listening to researchers who ask for an access code (to avoid copyright infringement) contacting the Langlois Foundation, 558 works from those are already freely available and can be listened to by the general public online. The database has also over 200,000 words, and there are multiple ways to find the information in there. The digital audio recording of a composition can be found by its title, the name of the composer, the country linked to that composer, the year or decade when the work was composed, etc. In addition, there are two playlists to access and listen to the compositions: one sorted alphabetically by the last name of the composer , the other sorted chronologically, following the year the piece was composed . Program notes, instrumentation, production studio, version, composerbs bio and more have been also included for each work when the information was available. Part of that comes from two previous reports I wrote commissioned by UNESCO, between 2002 and 2003: Historical Aspects of Electroacoustic Music in Latin America: From Pioneering to Present Days  and La música electroacústica en América Latina . They were published online and are available through the UNESCObs Digi-Arts knowledge portal. These texts include references to hundreds of composers who were born or pursued a portion of their professional careers in Latin America: 191 from Argentina; 14 from Bolivia; 90 from Brazil; 39 from Chile; 39 from Colombia; 5 from Costa Rica; 44 from Cuba; 3 from the Dominican Republic; 11 from Ecuador; 5 from El Salvador; 6 from Guatemala; 73 from Mexico; 3 from Panama; 4 from Paraguay; 15 from Peru; 12 from Puerto Rico; 27 from Uruguay; and 35 from Venezuela. This is one of the most visited and consulted collections of the Daniel Langlois Foundation. The Latin American Electroacoustic Music Collection has recovered and made visible (and listenable) the creative work of many composers otherwise almost forgotten. 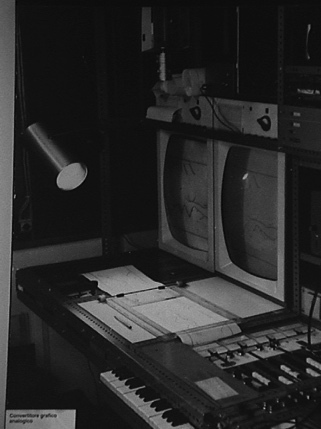 It has defied the hegemony of the electronic art history narrative, helping to break some barriers and slowly shifting and widening the way the history of electroacoustic music is been understood. Archiving and disseminating electronic and computer art -as well as a working on B a revised version of their history- is crucial to comprehend the present and to build our future. .
 Latin American Electroacoustic Music Collection. Home page. Davies, Hugh (1968). Répertoire international des musiques électroacoustiques/International Electronic Music Catalog. France: Groupe de recherches musicales, O.R.T.F. / United States: Independent Electronic Music Center. Latin American Electroacoustic Music Collection. Reginaldo Carvalho, Sibemol. Latin American Electroacoustic Music Collection. Juan Blanco, Interludio con máquinas. Latin American Electroacoustic Music Collection. Jorge Antunes, Valsa Sideral. Latin American Electroacoustic Music Collection. César Bolaños, Intensidad y Altura. Latin American Electroacoustic Music Collection. Composers by name and country. Latin American Electroacoustic Music Collection. Historical introduction (English). Latin American Electroacoustic Music Collection. Interviews. Latin American Electroacoustic Music Collection. Music selection (by composer). Latin American Electroacoustic Music Collection. Audio player (558 titles). UNESCO. Digi-Arts. 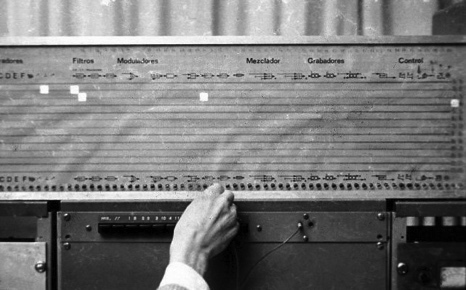 Historical Aspects of Electroacoustic Music in Latin America. UNESCO. Digi-Arts. La música electroacústica en América Latina. About the author Dr. Ricardo Dal Farra (ricardo.dalfarra@concordia.ca) is a composer, new media artist, curator and historian. He is professor at Concordia University, Canada and director of the CEIArtE-UNTREF Electronic Arts Research Centre, Argentina. His music has been presented in about 40 countries. He is the founder of the Balance-Unbalance and Understanding Visual Music conference series, and has been researcher and consultant for UNESCO in France, De Montfort University in the UK, Amauta in Peru and the National Ministry of Education in Argentina. Dal Farra was coordinator of DOCAM, the Documentation and Conservation of the Media Arts Heritage international research alliance. He created the Latin American Electroacoustic Music Collection.